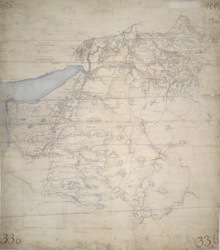 This drawing covers the boundary between the counties of Cardiganshire and Montgomeryshire. The border is marked as a red pecked line, following the course of the River Dovey for much of its length. Archaeological sites are noted in gothic script, an obligatory feature after 1816. A dot within a red triangle represents a trigonometric station, from which the surveyor took angular measurements in order to plot the location of topographical features.